Turn your event into the most stupendous party ever! Donate unused gift cards and residual balances - 100s of popular stores and restaurants. Better than any party favor. We accept digital and physical cards of any value. 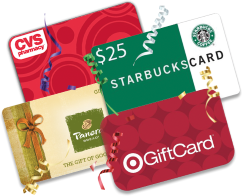 Let everyone know about your 'Let's Card Party' event, asking them to bring their unwanted or partially used gift cards to your event. Collect cards in a box for shipping to CharityChoice. For eGift Cards: Print the Digital Gift Card info; merchant name, card number, PIN, balance – all pertinent information, on an index card or secure paper. Place the paper into the host’s collection box along with the physical cards. Alternatively, make your donation online at Donate Your Card. NOTE: Use a magic marker to write the value/remaining balance (to the best of their knowledge) on the front of each card. Print a blank form to distribute to those who are not accessing the form on-line. Please be sure to mark each card with the residual balance. You will receive an emailed receipt after the cards are totaled and balances are verified. (usually 1 to 2 weeks after shipment arrives). Millions of Americans aren't playing their cards right. In fact, we've left more than $44 billion on the table, in the form of unused gift cards, according to a new study, and an additional $2 billion every year. "People are letting cash slip away that they could be using FOR THE GREATER GOOD." No cards can be returned, nor may the donation be canceled or changed; card value is subject solely to the gift card exchanger's determination. Funds are distributed quarterly, deducting a modest 10% admin fund-raising fee (only 5% fee for donations via a branded/coded link from your charity). Only charities listed with CharityChoice may be designated to receive funds from your donation. There are no Retailers in the list that match your search term. A Party of Giving Back … A Party to Remember!